Are there natural enemies of the cypress aphid? Find out more about those pesky aphids that causes a problem on certain conifers during the winter months. The cypress aphid, which has wreaked havoc among conifers in southern Africa over the past few years, is a pest which injects a toxin into the plant branches while sucking the sap for food. The first sign of damage is yellowing of the foliage, which later turns brown. Despite its brown appearance, however, the plant does not become dehydrated and remains pliable. As with all the many aphid species, the cypress aphid does have many enemies, including the adult and larva stages of ladybird species, parasitic wasps, hover flies, praying mantis and chameleons. The cypress aphid secretes a fair amount of honeydew and, if populations are very high, you might also find black sooty mould growing on the stems or leaves covered in honeydew. The control of ants nesting in the surrounding soil of plants will assist beneficial predators to control their prey more effectively. Ants, especially pugnacious and other ‘cocktail’ ant species, protect insects like cypress aphids against their natural predators in return for honeydew. The cypress aphid reaches its peak infestation during the cooler months of the year, starting from March until August with a drop in numbers as it becomes warmer in summer. Whilst most aphid species are found on young, new, sappy growth, the cypress aphids are found on the main stem as well as lateral branches and not necessarily on the end of branches or new leaf growth of conifers. Cypress aphid populations are found in colonies ranging from a few to hundreds. These colonies are more hidden where they are found on the actual main or lateral stems of conifers and you need to look deeper inside the plant – as opposed to most common aphids which are easily detected on the end of developing branches and or flower stems. 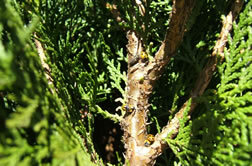 Once you start looking inside your conifers, you might come across ladybirds mating in the middle of winter. It is also not unusual to find a praying mantis having a feast. The biggest challenge is to safeguard these populations, while still bringing the aphid population under control. Simply put, use organic formulations like Ludwig’s Insect Spray or Pyrol and avoid applying them as a general full cover spray. Pull the lateral branches away from the main stem to expose the aphids, and without drenching, hold the spray nozzle against the stem or branches and, at low pressure, allow the spray mixture to run down the stem and branches. By doing so, a huge percentage of the aphids are destroyed with one treatment and, because there was no full body contact with the ladybirds or praying mantis, their lives are spared. 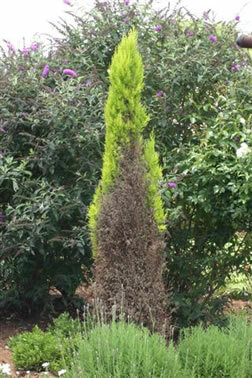 Two to three treatments during the months of May, June, July and August will give your conifers maximum protection. Organic formulations such as Margaret Roberts’ Organic Insecticide and Vegol, which contain canola oil and no pyrethrum, have no or a very low negative impact on adult ladybirds or other bigger-bodied predators when applied as a full cover spray due to the fact that the recommended dosage rates are mainly effective for controlling very small-bodied insects the size of aphids, whiteflies or red spider mite.